The phrase ehyeh asher ehyeh (rendered as “I am who I am” in the KJV) derives from the Qal imperfect first person form of the verb havah: "I will be," and therefore indicates a connection between the Name YHVH and being itself. YHVH is the Source of all being and has being inherent in Himself (i.e., He is necessary Being). Everything else is contingent being that derives existence from Him. The name YHVH also bespeaks the utter transcendence of God. In Himself, God is beyond all “predications” or attributes of language: He is the Source and Foundation of all possibility of utterance and thus is beyond all definite descriptions. This special Name of God (YHVH) was moreover combined with “The God of your fathers, the God of Abraham, the God of Isaac, and the God of Jacob” to be God’s Name forever, “my memorial unto all generations” (see Exodus 3:15-16). “The Holy One, Blessed be He, said to those, You want to know my name? I am called according to my actions. When I judge the creatures I am Elohim, and when I have mercy with My world, I am named YHWH” (Exodus Rabbah 3:6). Elohim is the Name given for God as the Creator of the universe (Gen 1:1-2:4a) and implies strength, power, and justice. YHVH, on the other hand, expresses the idea of God’s closeness to humans. For example, YHVH “breathed into his (Adam’s) nostrils the breath of life” (Genesis 2:7). On account of this, the Masoretes ensured that the Name of the LORD would not be taken in vain by substituting the vowel marks for Adonai and putting them under the letters in the running text (this is called Qere [what is to be read] as opposed to Ketiv [what is to be written]). The Hebrew text, then, contains the Ketiv but uses the vowels of the Qere and this has led to the obviously incorrect pronunciation of the Name as “Jehovah” (in older English, “J” had a “y” sound). It was later speculated that perhaps the Masoretes reversed the vowels for Adonai when applied to the letters in the running text, so some attempted to “correct” the pronunciation by pronouncing the Name as “Yahoveh” or “Yahveh.” This, too, is incorrect (though the construct form “Yah” probably is part of the original pronunciation (e.g., see Psalm 68:4; Isaiah 26:4)). Note that Yahweh is most likely also an incorrect transliteration, since there is no “w” sound in Hebrew. Since ancient Hebrew did not use any vowel markings, the actual pronunciation of the sacred Name is simply not known. In ancient Temple times, only the Kohen Gadol (high priest) would utter the Name during Yom Kippur [Yoma 39b]. The Jewish tradition is to not pronounce the sacred Name at all, but to substitute the word Adonai (“my Lord”) in its place. Thus, when reading Torah, you do not attempt to vocalize the Name, but say Adonai instead. When not reading Torah or the Siddur, most observant Jews refer to the sacred Name simply as Hashem or “the Name” (Lev. 24:16). In Hebrew the sacred Name is called Shem HaMeforash, “the ineffable Name.” Attempts to provide an exposition of the Name have come to be known as Shelosh Esreh Middot, or the Thirteen Attributes of God and are usually based on exegesis of Exodus 34:6-7 (mystical speculation about the Name is found in Kabbalistic literature). There are some people who, despite the educated uncertainty of careful scholarship and Jewish tradition, pretend to “truly” understand the phonetics of the Sacred Name and offer to “restore it” to those of us willing to be initiated into their secret knowledge. For example, there are some who want to use a “w” for the Vav in the Name, and then permutate the nikkudot to find a favored reading. This is a dubious practice, however, since even our English idea of "w" is laden with cultural biases, and no practicable equivalence can reasonably be made. Language, in other words, is about meaning, not about technique. Frankly, I consider the search for a conjuration of the Sacred Name to be a form of gnostic occultism, symptomatic of people who elevate spiritual technique and "abracadabra" above the shared meaning of the “Presence of God.” Moreover, such conjuration is a sign of unbelief, since once you understand the meaning of the Name, the words you use to express it are incidental. Perhaps this explains why we have such a plethora of various Names and Titles of God given in the Tanakh. Like poets, the sacred writers sought for various words to express the Reality that stands behind the glyphs. But once you get ahold of the Reality (or rather, the Reality gets ahold of you), the words you use to express your awe will always be limited and seem inadequate. Though we do not know how to pronounce the sacred Name, we can be confident that the letters derive from the Hebrew verb “to be” (hayah) and indicate God’s utter transcendence as the Source and Ground of all being. KJV Note: YHVH is transliterated as “Jehovah” in four passages where the name is particularly stressed (Exo 6:3; Psa 83:18 [H 19]; Isa 12:2; Isa 26:4] and in three passages to form transliterated constructs (e.g., Jehovahjireh (Gen 22:14; cc Exo 17:15; Jud 6:24)). This is a convention is many Hebrew prayerbooks and dikdukim (grammars) to avoid casually writing or reading the Sacred Name. Note: The sacred Name for God was uttered aloud only 10 times once per year (during Yom Kippur) by the Kohen Gadol. When the people heard the Name, they prostrated themselves in deep reverence (Yoma 39b). This term is often used to refer to the Sacred Name when studying the Scriptures and considering the Sacred Name of YHVH. This is often abbreviated simple as . (eh-YEH a-sher eh-YEH) I AM THAT I AM. (Exodus 3:14; cp. John 8:58). The LORD God (Gen. 2:4). This Name shows that the Source and Ground of all being is also the personal God and Creator of the entire universe. The LORD my God (Psalm 13:3). The LORD our Father (Isa. 64:8). The LORD Most High God (Gen. 14:22; Psalm 7:17; Psalm 47:2). The LORD God of Israel. Identifies YHVH as the God of Israel in contrast to the false gods of the nations (Isa. 17:6). “The Lord your Sanctifier.” Portrays the Lord as our means of sanctification or as the one who sets believers apart for His purposes (Ex. 31:13). The LORD my Miracle, or The LORD my Banner; (Ex. 17:15) (rendered in the KJV as the Jehovahnissi). The LORD our Maker (Ps. 95:6). The LORD our Righteousness (Jer. 23:6, 33:16). The LORD of armies (or hosts). References: Exo 12:41; 1 Sam. 1:11; 4:4; 15:2; 17:45; 2 Sam. 6:2, 18; 7:8, 26f; 1 Ki. 18:15; 2 Ki. 3:14; 1 Chr. 17:7, 24; Ps. 24:10; 46:8, 12; 48:9; 59:6; 69:7; 80:5, 20; 84:2, 4, 9, 13; 89:9; Isa. 1:9, 24; 3:1, 15; 5:7, etc. ; Amos 4:13; 5:14ff, 27; 6:8; Mic. 4:4; Nah. 2:14; 3:5; Hab. 2:13; Zeph. 2:9f; Hag. 1:2, 5, 7, 9, 14; 2:4, 6ff, 11, 23; Zech. 1:3f, 6, 12, 14, etc. ; Mal. 1:4, 6, 8ff, 13f; 2:2, 4, 7f, 12, 16; 3:1, 5, 7, 10ff, 14, 17, 19, 21. The LORD my Shepherd (Ps. 23:1, Ez. 34:2). The LORD who heals you; The LORD your healer; (Ex. 15:26). Sometimes mistakenly named the LORD our Healer. The LORD of Peace (Judges 6:24) (rendered in the KJV as Jehovahshalom). “The LORD your [pl.] God” (Lev. 19:3). “The LORD my Rock and my Redeemer” (Psalm 19:14[5h]). “The LORD God of David” (Isaiah 38:5). The LORD my Rock (or Hiding Place, as in the crag of a cliff) (Psalm 18:2). This mysterious Angel was treated as YHVH Himself, exercising divine prerogatives and receiving worship (see Genesis 16:7, 9, 11; Exodus 3:2-6; Judges 13:21-22). References: Genesis 16:7, 9ff; 22:11, 15; Numbers 22:22ff, 31f, 34f; Judges 2:1, 4; 5:23; 6:11f, 21f; 13:3, 13, 15ff, 20f; 1 Kings 19:7; 2 Kings 1:15; 19:35; 1 Chronicles 21:16, 30; Psalm 34:8; Isaiah 37:36; Haggai 1:13; Zechariah 1:11f; 3:1, 6; Malachi 2:7. Note: The Aramaic Targum of Onkelos (Genesis 16:13) identifies the Angel of the Lord with the Shekhinah, the concrete manifestation of the presence of God. The sacred Name for God was spoken only 10 times once per year (during Yom Kippur) by the Kohen Gadol. When the people heard the Name, they prostrated themselves in deep reverence (Yoma 39b). (e-loh-HEEM) n. God; gods. The plural form of el, meaning “strong one.” Occurs 2,570 times in the Tanakh. (Isa. 54:5; Jer. 32:27; Gen. 1:1; Isa. 45:18; Deut. 5:23; 8:15; Ps. 68:7). First name of God in Tanakh. See the Names of God. (e-loh-heem ah-VEE-noo) n. phr. “God our Father” (John 8:42). (el shad-DIE) n. The All Sufficient God. Shad means “breast” in Hebrew (Gen. 17:1; 28:3; 35:11; 43:14; 48:3; 49:25; Exod. 6:3; Num. 24:6; Ruth 1:20; Job (various references); Psa. 22:10; 68:15; 91:1; Ezek. 1:24; 10:5; 23:21 etc.). Occurs 48 times in the Tanakh. (el-YOHN) n. The Most High; God; Upper; Highest. See the Names of God. (AHB-bah) Aramaic. n. Abba. “Daddy,” “dear Father,” “papa”; a term of endearment for one’s father (Mark 14:26; Rom. 8:15; Gal. 4:6). Abba is a more intimate expression than the normal Hebrew word for “father” (av). Note that the dagesh in the Bet is forte since it is preceded by a vowel. (ah-DOHN) n. Adon. Lord; mister; sir. Also a name for God, e.g., Isa. 10:33. See the Names of God. (ah-doh-NIGH) n. pl. “My Lord(s).” Spoken by observant Jews instead of God's personal name YHVH. See the Names of God. The Name for God used most frequently in Berachot (blessings) and in reading the Torah aloud. It means "Master" (see above). The connotation is "Master of the universe" and "Master of the individual." Note that this name uses the plural of majesty and indicates the Hashalush Hakadosh (Holy Trinity). (ge-fen E-met) n. True Vine (John 15:1). See the Names of God. (hak-ka-DOSH ba-rukh HOO) phr. “The Holy One, blessed be He”; see the Names of God. (ha-ra-cha-MAHN) n. God the merciful One. See the Names of God. (ha-ro-eh hat-TOHV) n. The Good Shepherd (John 10:11); Title of Yeshua the Messiah. See the Names of God. (hash-shee-LOOSH hak-ka-DOHSH) n. The Holy Trinity. The Tri-une nature of the echad nature of Adonai. See the Hebrew Names of God. The personal Name of Adonai, the transcendent Source and Ground of all being whatsoever. This Name appears 5,200+ times in the Tanakh (rendered in the KJV as the LORD [all caps]). In the Tanakh, YHVH is the personal name of God and his most frequent designation. This is the Ineffable Name or Unutterable Name of the God of Israel. Because it is composed from the four Hebrew letters , it is also referred to as the “Tetragrammaton,” which simply means “The Four Letters.” In those contexts where the actual title "Lord" (Adonai) also occurs, YHVH is translated as “GOD,” (all caps). See the Hebrew Names of God. (ye-SHOO-ah ham-mah-SHEE-akh hoo hah-ah-DOHN) phr. “Jesus Christ is LORD.” The ascription that Yeshua (Jesus) is the Mashiach (Messiah) and also Adonai come in the flesh (Phil 2:11; Romans 10:9; 2 John 1:7). See the Hebrew Names of God. (ye-SHOO-ah hoo hah-ah-DOHN) phr. “Jesus is LORD.” Also Yeshua ha-Mashiach hu ha-adon (Jesus Christ is LORD). The ascription that Yeshua (Jesus) is Adonai come in the flesh (Romans 10:9; Phil 2:11; 2 John 1:7). See the Hebrew Names of God. (The so-called “Sacred Name” movement that purports that the “true name” of the Messiah is “YAHushua” or “YAHoshua” (or some variant thereof) is founded on faulty linguistics and esoteric doctrine. These people think that the sacred Name (YHVH) is best rendered as YAHWEH, and suppose that since Jesus said He came in His Father’s Name (John 5:34), YAH must somehow appear in the spelling of this name. Hence we have YAHshua, or YAHoshua, or some other spelling. This interpoloation of the phoneme YAH comes at the expense of the original Masoretic text and standard Hebrew usage. Some in this movement go so far as to believe that you can only be saved if you pronounce the Sacred Name correctly! As a friend of mine pointed out, this teaching is inherently anti-semitic, since in order for this to be true, the "rabbis" must have corrupted the text and deceived the people. Moreover, according to them, the Greek New Testament text has been corrupted as well, since it does not directly contain the Sacred Name). For more information, see the Hebrew Names of God. (ME-lekh mal-KHAY ham-me-lah-KHEEM) n. King of the king of kings. A Title for God. See the Names of God. (seh ha-e-loh-HEEM) n. The Lamb of God (John 1:29); a Title for the Messiah Yeshua. See the Names of God. The noun seh means lamb. (mah-SHEE-akh) n. Messiah; The Anointed. Yeshua ben Yosef is the promised Mashiach of Israel. See the Names of God. (sar-shah-LOHM) n. Sar-Shalom; a title for the Messiah. See the Names of God. Repurchase a field which was sold in time of need (Lev 25:25) or free a slave who sold himself in time of poverty (Lev 25:48). Such purchase and restitution was the duty of the next of kin. This is called redemption of the poor (the best example is found in the book of Ruth, where the near kinsman was willing to redeem the field for Naomi, but not marry Ruth based on the levirate marriage laws. Boaz then stepped in as a picture of Yeshua). Redeem property dedicated to the Lord (Lev 27:11). Function as the "avenger of blood" for a murdered man (cf. Num. 35:12). Apparently the idea is that the next of kin must effect the payment of life for life. As a slave is redeemed by payment, so the lost life of the relative must be paid for by the equivalent life of the murderer. 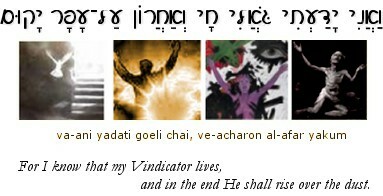 For I know that my Vindicator lives, and in the end He will stand upon the earth. Other terms connoting redemption are moshia (yasha), pada, etc. The verb palat is used (mostly in the Psalms) to express the idea of being rescued from trouble (see the Names of God pages for more information). (ROO-akh hak-koh-DAYSH) n. Ruach Hakodesh; Holy Spirit; Divine Spirit; Inspiration; Prophecy. See the Names of God. (reeb-BOH-noh shel oh-LAHM) n. The LORD; the Master of the Universe. (bar e-nash) n. (Aramaic) Son of Man; The Messiah as seen by Daniel the prophet (Daniel 7:13-14), who “was given dominion, and glory, and a kingdom, that all the peoples, nations, and languages should serve him: his dominion is an everlasting dominion, which shall not pass away, and his kingdom that which shall not be destroyed.” One of the titles of the Messiah. Bar enosh, like Hebrew ben adam, can also mean "son of man," or "typical man," or simply "man." Yeshua is all of these: the Messiah, a typical (ideal) man, one schooled both in heaven and on earth to be a man. Yeshua refers to himself frequently by this title, stressing his full identification with the human condition, as taught in Rom.5.12-21, 8.3-39; 1 Cor. 15.21-49; Phil. 2.5-11; Heb. 2.5-18, 4.15. (mo-SHEE-ah) n. Deliverer. One who “makes wide" or "makes sufficient.” One who gives freedom from distress and the ability to pursue one's way. Often understood in a “this-worldly” manner of political deliverance, the word is also used to ultimately portray Adonai’s deliverance and salvation of the Israel of God. Derived from the Hebrew verb Yasha’. Note that the Name for Jesus - Yeshua - is derived from this same root. See Names of God.